RealSpace Theatre presents Falling Angel, a contemporary vaudevillian style comedy written by Erica Wood, Co-creative Director of RealSpace, in collaboration with RealSpace founder and fellow Creative Director, Bruce Hunter – at the Toronto Fringe Festival. The diverse cast is comprised of actor/ comedian/clown, Stevie Jay, Second City alumnus, Jamillah Ross, and classically trained, Erica Wood. Andrea Ouellette (Centre of Gravity) stage manages and costume designs. “The process has been marvelously collaborative – this is a dream team to work with on this production, at this venue,” says Wood. 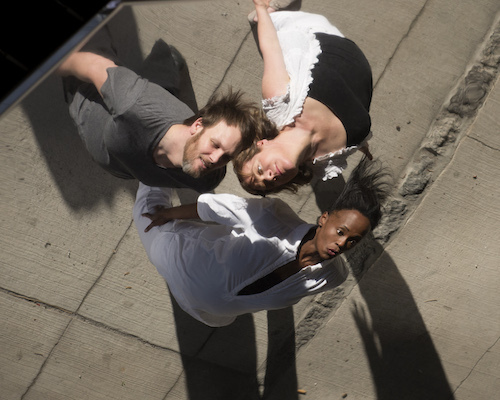 Falling Angel mixes things up from previous RealSpace productions in non-traditional spaces – including the 2010 Fringe hit, The Getaway, that took place in a moving van and the zombie hit show Dine Her – and immerses audiences in the core of the city in the park at Queen & Shaw. Audiences will be seated on picnic blankets, benches and whatever is handy, and integrated into the action. The short running time (45 minutes) allows audiences to enjoy this outdoor production coming from or going to another Fringe show. Bring a picnic and join the flock! Content Warnings: Sexual Content, Audience Participation, Mature Language. The Fringe Festival considers this venue to be wheelchair-accessible. Note that this production plays outdoors, and audience members may not be provided with seating.